I was wondering if the mushroom pet was bugged. Right now, it's eating one mushroom and filling every bowl in an inventory. I believe it was 1 for 1 before? 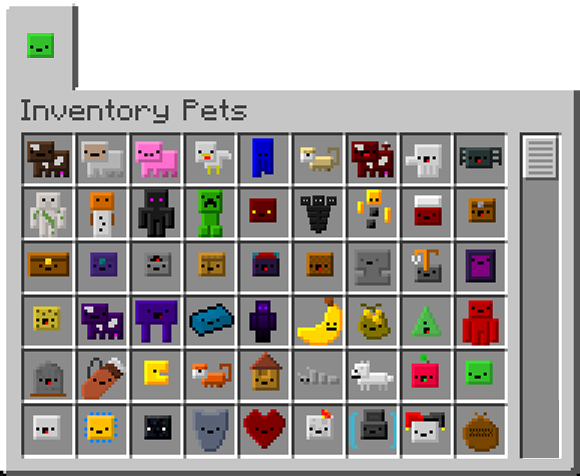 Is there any way to make Inventory Pets work outside of hotbar (still in the inventory)? Like is there anything in the config to toggle it on/off? Well, you can also use Cloud Blocks to look underground. You'll need a silk touch pickaxe to harvest them. Thanks for the report, will check it out. I've found multiple bugs but are they even worth reporting since I don't even get a simple response to my other comment here or a PM? Report them on my github (go to Projects then Issues). I don't receive notifications on this forum. is the purple cow your favourite pet in the mod? How do I enable holiday pets to be all year round? April fools has it's own year round config option, but the rest need a number for the month number. Does setting it to 0 enable all months or something? Also in 1.7.10 I think with Biomes O Plenty installed underwater dungeons don't spawn. I searched for a while and didn't find any but was very easy to find all other types of dungeons. Well, you can enable the holiday pets by changing the month... but they inly work from the 12th day to the 25tgmh of the month you choose. Underwater dungeon are the rarest and on 1.7.10 only spawn in beach biomes. The way this is coded, the biome has to have 'beach' in the biome name.